Mini CDR Media is just three inches in diameter yet holds either 184 Megabytes of data or around 20 minutes of music. + They have no stacking ring! Great for onbody printing It is designed to fit in the recessed area on the tray of a CD Recorder or player. Since a CD is recorded from the inside out, a CD Recorder or player can use this 3-inch media without a problem. Mini CDR disks are ideal where shirt-pocket size is desired. 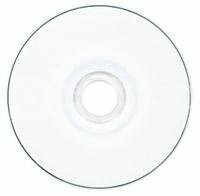 It is recorded or played just as a full-sized disk is; it just holds less data or music. Our 3-inch media is also compatible with Sony's MVC-CD1000 Mavica digital camera. 8CM . White . Printable . CDR . with . vinyl . wallet . Pack . of . 100 . Unbranded .